A seldom available prestigious converted flat, set on the desirable first floor within the impressive redeveloped Alexandra Gate complex. Alexandra Gate is a well maintained complex set amidst landscaped communal gardens and private residents parking. The accommodation is beautifully presented and is sure to appeal to a variety of discerning purchasers due to the quality of this apartment and the convenient location on offer. The accommodation comprises of a welcoming reception hall incorporating a deep storage cupboard. The hallway leads into the modern and contemporary styled lounge which is open plan to the modern fitted kitchen offering ample storage, a range of integrated appliances and a breakfast bar. In addition there is a spacious double bedroom incorporating fitted wardrobes and the accommodation is completed by a stunning shower room which is fully tiled. The specification of the property includes single glazing, electric heating, a secure entrance with CCTV video entry system leading into a communal reception area with a stairwell leading to the upper floors. 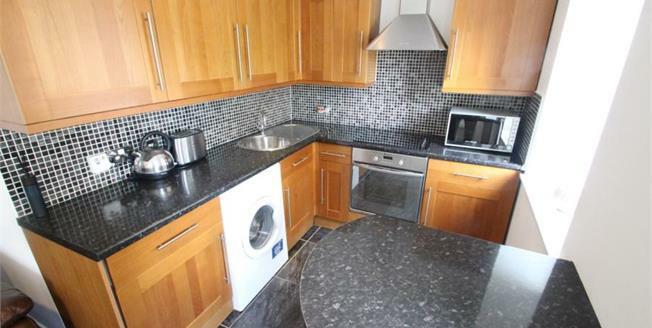 The property is well placed for all local amenities including shopping and schooling. Excellent local transport networks compliment the property, providing access to all surrounding areas, including the conveniently located Paisley Canal train station with a frequent direct service to Glasgow Central. Please refer to the published Home Report for EER Banding.